The Kids On Air program creates dynamic learning experiences through projects that are designed specifically for the interests of kids and taught by amazing educators! 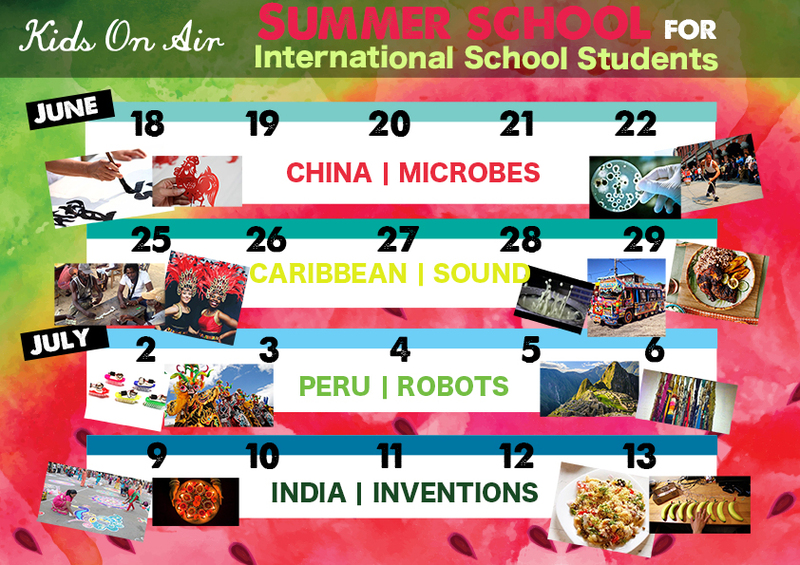 Join us as we explore four different countries and dive into a variety of cultural, creative, cooking, science, and engineering projects! Sign-up is for the week. ＊From 14:00～19:00, students will take part in the Kids On Air regular after school class. ＊Project and material fees are included. – Please submit pick up/ drop off service requests using the application form below. Once we receive your requests, we will check availability and get back to you with confirmation. – International summer school minimum class size is 4 students. If minimum class size is not reached, the weekly course will be cancelled. – If maximum class size is reached, you may be placed on a waiting list.